To support D2KDay on Monday 8 August, SNHN hosted a morning tea event with staff and members of its board, to facilitate conversations around death, dying and bereavement. One of our board members and GP, Dr Stephen Ginsborg, spoke to us about the importance of having these discussions and making informed decisions about end of life planning. When people develop their death literacy, they are better equipped to make end of life plans, such as writing a will and making an advance care plan. When these wishes are shared with families or friends, we will be better equipped to care for our loved ones experiencing death, dying or grief. Sadly, over 70% of us die in hospital, though most of us would prefer to die at home. 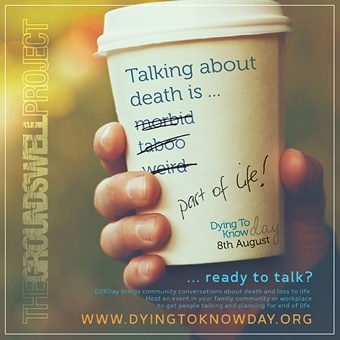 Dying to Know Day is a good opportunity to start having these important conversations, and take useful action towards having a plan.